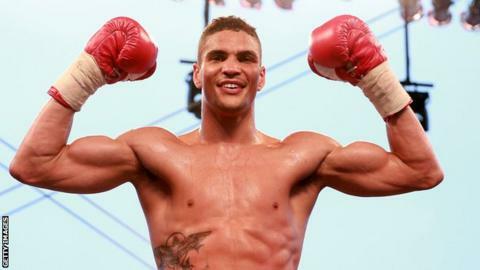 Olympic bronze medallist Anthony Ogogo says he has unfinished business at London's ExCeL arena when he returns to the ring on 14 December. Ogogo's mother was recovering from a brain haemorrhage at the time. "Emotionally and physically I had nothing left. It will be nice to go now and put on an emphatic performance," he told BBC Radio Suffolk. "My mum's doing fantastically well. I'm injury-free now. For the first time in a long time I can concentrate on the boxing." Lowestoft's Ogogo turned professional shortly after the Olympics and won all three fights since, two of them by knockout. He had to pull out of a bout on the Floyd Mayweather Jr v Saul Alvarez undercard in Las Vegas in September because of injury. But now, following an agreement struck by his American promoter Golden Boy and Matchroom Sport, he will appear on next month's ExceL card featuring IBF intercontinental lightweight champion Kevin Mitchell and interim WBA middleweight champion Martin Murray. "Martin's my weight and a good four or five years on in his career more than me," said Ogogo. "It will be good to watch somebody like him at the very top of the middleweight division and see what I've got to do to get to that level. It's a level I believe I'm going to get to."